The Future as a Project | Doxiadis in Skopje opens on Monday 17 December at 20.00 at Benaki Museum / Pireos 138.
ifty-five years after the 1963 earthquake that demolished 80% of the city of Skopje, the contribution of Constantinos A. Doxiadis in the redesign of the city is still largely unknown. Meanwhile, the history of the modernist buildings that dotted the new cityscape, after Kenzo Tange’s office took on the task of redesigning the city centre, remains unappreciated. Many excellent examples of metabolism and brutalism have been suffering from decades of neglect. 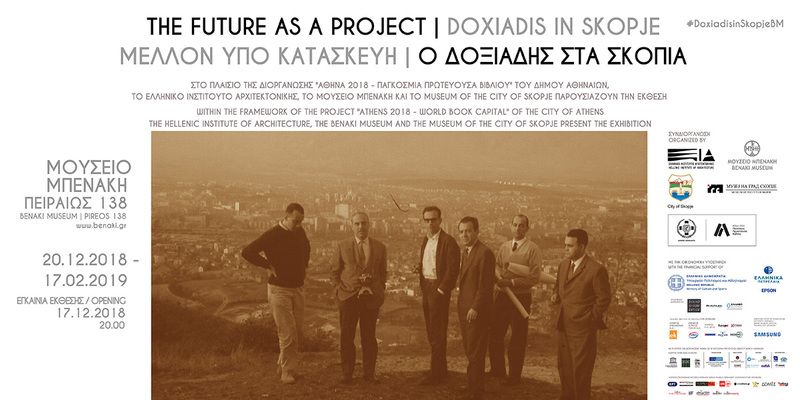 The Future as a Project | Doxiadis in Skopje, opening on Monday 17 December at 20.00 at Benaki Museum / Pireos 138, presents for the first time Doxiadis’s work in Skopje, which includes a detailed survey of the affected areas, strategic plans for the city and a new outline for the master plan. In addition, it introduces to the Greek public the work of Kenzo Tange for Skopje’s city centre, and showcases a series of modernist buildings authored by leading Yugoslavian architects that still stand in the city today. The exhibition and its accompanying events are organised by the Hellenic Institute of Architecture, the Museum of the city of Skopje and the Benaki Museum, co-organized and supported by ‘Athens 2018 – World Book Capital’ by the City of Athens (of which major donor is Stavros Niarchos Foundation), with the financial support of the Ministry of Culture and Sports. The exhibition material has been contributed mainly by the C. A. Doxiadis Archives of the Constantinos and Emma Doxiadis Foundation and the personal collection of Jovan Ivanovski, Ana Ivanovska Deskova and Vladimir Deskov. Within the framework of the exhibition a 1-day international conference will take place at the Benaki Museum / Pireos 138 on the opening day (15.00-19.30, free entrance). On Tuesday 18 December, a roundtable will take place at 18.00 (RSVP required), in Greek, and will include a presentation of the catalogue. Two free guided tours of the exhibition will also be carried out by the curatorial team right before the discussion (17.00-18.00, RSVP required).